As the United States and the world move further and further away from a Biblical worldview, the attitude toward Israel becomes more and more hostile. Ignoring the fact that Israel (Ezek 5:5) is God’s chosen land (Ps 24:1; Deut 32:8,9), for His chosen people (Deut. 7:6), will eventually be the harbinger of the final wars of this earth during the coming 7 Year Tribulation. Zech. 12:3 “And it will come about in that day that I will make Jerusalem a heavy stone for all the peoples; all who lift it will be severely injured. And all the nations of the earth will be gathered against it. Currently the United States is still standing by Israel. At least publicly. In actuality, the U.S. relationship with Israel is hanging by a thread. And as the above verse states, eventually ALL nations, including the U.S., will be against Israel. When the Rapture happens, there will be none left to support Israel. We can only pray that the U.S. won’t abandon Israel until after the Rapture! It’s an incredible fact that Jews have won 20% of the Nobel prizes (163 out of 829) since it began awarding them in 1901! It’s also amazing to see what Israel has accomplished since it was re-founded in 1948, when it was given a U.N. Charter. Especially since it has only 1/1000th of the world’s population. • Israelis developed the cell phone. 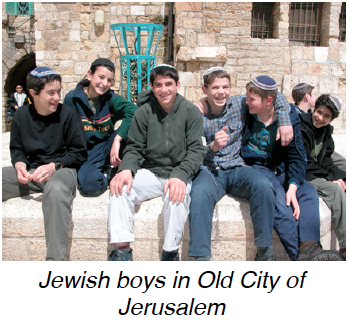 • Israelis developed WIndows NT & XP operating systems. • Israelis developed the Pentium-4 microprocessor. • Most microprocessors in computers were made in Israel. • Israelis developed voice mail. • Israelis developed AOL Instant Messenger. • Israel has the 4th largest air force in the world, after U.S., Russia, & China. • Israel has a $100 billion economy. • Israel has the highest percentage of home computers per capita. • Israel is second in the world for start up companies, after the U.S. • Israel is #2 in the world for venture capital funds, after U.S. • Israel is #2 in the world for hi-tech companies, after Silicon Valley, U.S. • Israel is #3 in the world for companies listed on NASDAQ, after U.S., Canada • Israel is #1 in biotech start ups. • Israel is #3 in the world in university degrees, behind the U.S. and Holland. • Israel is #1 in the world in museums per capita. • Israel is #1 in the world in scientists and technicians in the workforce. U.S. is #2. • Israel is #1 in the world for those employed in technical professions in workforce. All of this, and much more, was done while having to build a nation from scratch, fight constantly with her neighbors who are committed to her destruction, and deal with anti-semitism on a global scale. One of our best selling DVDs of all time is by Dave Reagan and is entitled “The Miracle of Israel.” It covers how, time and time again, God miraculously protected Israel as she fulfilled the Ezekiel 37 prophecy of the “dry bones” returning to her homeland after being exiled for some 2000 years. We want everyone to see this DVD, it’s an eye-opener.